ProtoMon is optimized to constantly monitor your servers and computers in 24/7/365 mode. But sometimes you may wish to stop the monitoring process for the certain periods of time. For example you may need to restart your server or do some planned maintenance jobs. You can turn off some computers in your office on the weekends, so there is no need to monitor them and to receive the failures notifications. With ProtoMon you can easily handle these situations. It includes a built-in scheduler that allows you to specify any number of one-time or recurrent maintenance intervals when the program shouldn't check your servers. Switch to the Maintenance tab to manage the maintenance schedule. You will see the interval list on the left and its graphical representation on the right. To attach some intervals to one or more monitors, select the monitors from the list and then check the intervals you wish to attach. The calendar on the right is displaying all the available intervals. The attached (checked) intervals are displayed as the high and less transparent blue bars, while the others are the low and more transparent. The selected intervals (whenever they are checked or not) have the double border around the bar. To select an interval you can click its bar on the calendar. To attach the interval to the selected monitors you can double-click the bar. Use the From date-picker to specify the first date to be displayed on the scheduler calendar. You can also use the mouse wheel over the calendar to scroll it to the needed date. Specify the name of the interval to be displayed in the list. If you leave the Name field blank, ProtoMon will generate the descriptive name automatically. Specify the start date, start time, and end time of this interval. 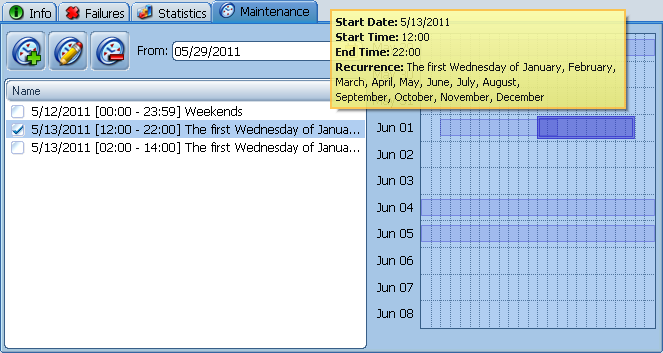 Start date is a date from which this interval will be enabled. Start time and End time is a time within every single day when the interval can be active. The last one parameter is Recurrence, which specifies the days when the interval is actually active. 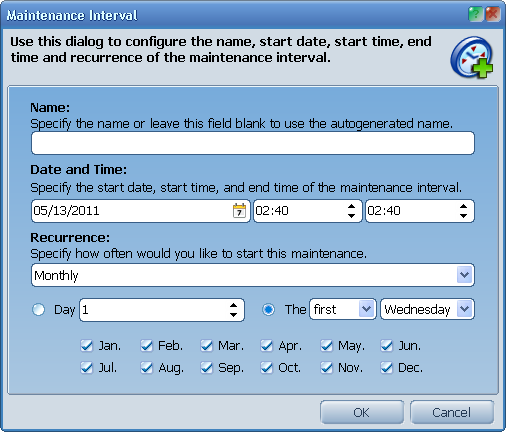 You can set one-time, daily, weekly or monthly recurrence, and specify the custom set of days or months when the maintenance should occur.